State #16 checked off the list. We flew into Phoenix Friday morning, arriving around noon. We headed straight to the expo. 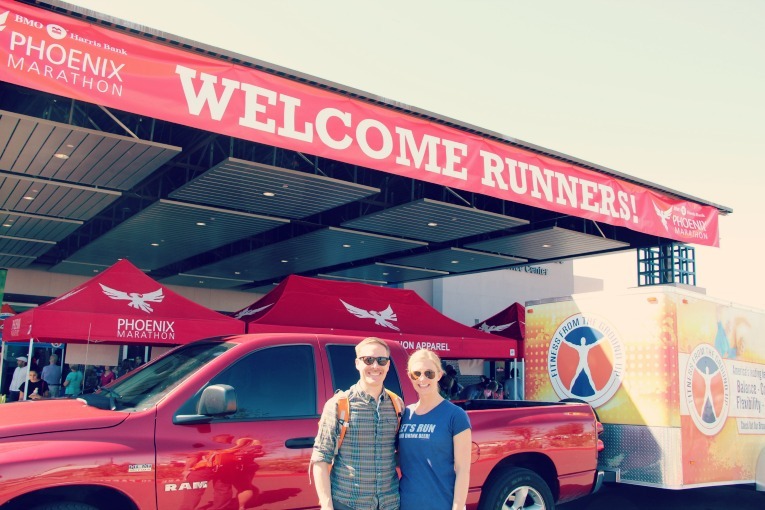 The marathon expo was held on Friday, February 26 from 9:00 am until 9:00 pm at the Sheraton Mesa Hotel. Parking was free and plentiful. It was a small-ish expo, and a little crowded, but it was still quick to pick up our bibs and gear. 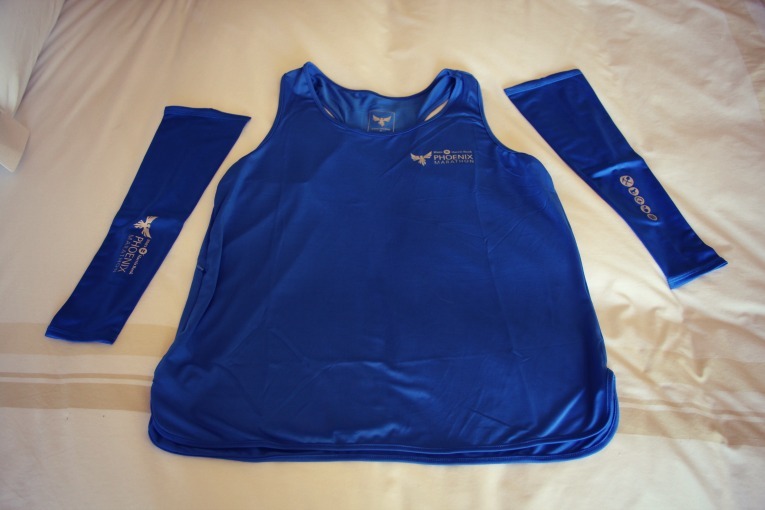 I was really surprised by the cool tank tops that all female runners received. The women received a tank (with a zippered pocket!) and the men’s shirts were the same color/material, but short sleeved. We both received matching arm sleeves. Very nice! 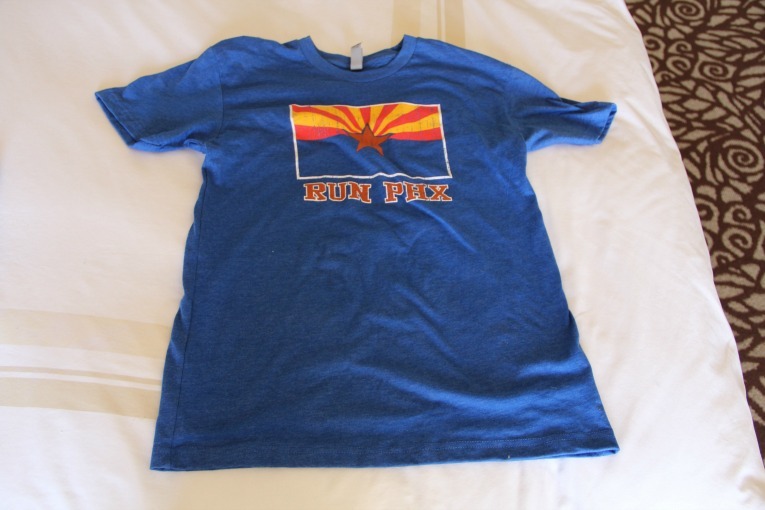 I also purchased a cotton “Run PHX” tee from the official race gear. They were actually getting pretty low on supplies of race gear by the time we were there, but I’m happy with this cozy tee. The marathon started at 6:30 am. There was also a half marathon and a 10k race associated with the event. Both of the other races started at 6:30 but from a different location. The Phoenix Marathon is a point-to-point course, so we had to catch a shuttle bus to the start at 4:30 am. The buses ran from 4:00 am until 5:15 am. I heard that some people actually had to chase down the last bus. Plan ahead and get there on time. We arrived at the start line around 5:00 am. We had plenty of time to use the port-a-potties and plenty of time to hang out by the fires and heating lamps, not that it was even that cold. It was probably about 55 degrees at the start. Around 6:00 am, I took a GU and we dropped off all our gear at the gear truck and made our way towards the starting line. With about 3,000 full marathoners, there weren’t corrals for different paces, but there were pacers. Dustin and I placed ourselves close to the 3:40 pacer. Around 6:20, there were fireworks (such a nice touch) and the national anthem. Promptly at 6:30 am, it was RACE TIME! 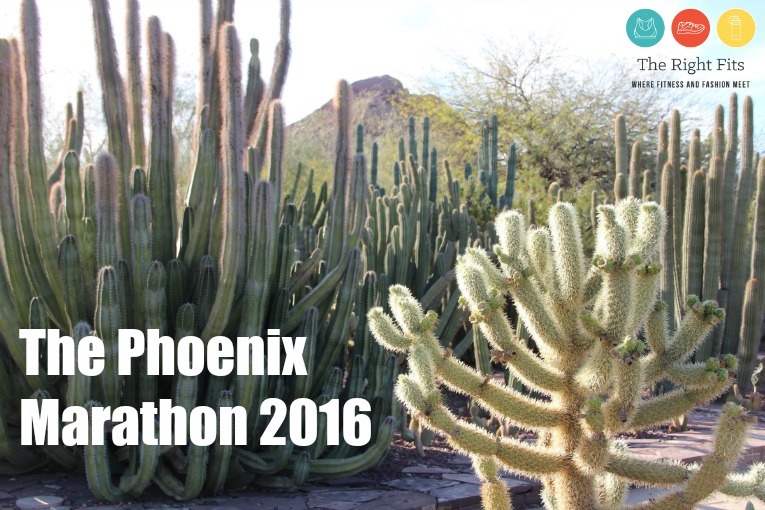 The Phoenix Marathon is a point-to-point course. The first 5-7 miles are mostly downhill. Dustin had to keep reminding me to slow down; it was easy to get going too fast with the downhill. The first half of the course was much prettier than the second half. The first half had great views of the desert and mountains, whereas the second half was a bit more industrial and not quite as scenic. Ugh, the weather. It was 91 degrees the day before when we went to the expo. Kind of psyched me out just a bit. Fortunately the whole thing about “dry heat” is true. By the time we finished the race, it was almost 80 and while the heat was definitely a factor in my personal performance, it didn’t feel as hot as 75 would feel in Minneapolis. The “no humidity” definitely helped. I wore my favorite Oiselle roga shorts, a Moving Comfort bra, this Brooks tank (so light- I plan to buy it in more colors! ), this Lole hat, my trusty Brooks Ravennas, a pair of Fitsoks, and my Garmin 225. I used this tape to put my name on my shirt. As I mentioned above, I took a GU about 30 minutes before the start of the race. I have done that for my last 3 marathons and it seems to work well for me to start fueling before the race. Throughout the race, I took 4 more GU’s, usually every 5 miles or so. They gave out Clif Shots on the course, and while I grabbed one, I only took the GU’s that I brought with me. They served Gatorade Endurance on the course; I drank water and Gatorade at basically all the support stops since it was so hot. *Also, I upped my salt intake in the day before and morning of the race, sprinkling more salt on my bagel with peanut butter race morning. I ate two bananas race morning and a cup of coffee. If you follow me on Instagram/Facebook/Twitter, you already know the results. My splits paint a pretty good picture of what happened. Mile 20: 8:51…the heat! I started walking through the water stops here. They say the marathon is won/lost in the last 10k. Of course, I wasn’t looking to “win” anything, but I would say the last 10k clearly determined my race results. You can see exactly where the heat started to get to me- the last 10k. It was so sunny and so hot at that point. I could feel my core body temperature rise with the temperature and it became a task to try to cool down. But still, I did it. I qualified for the Boston Marathon. 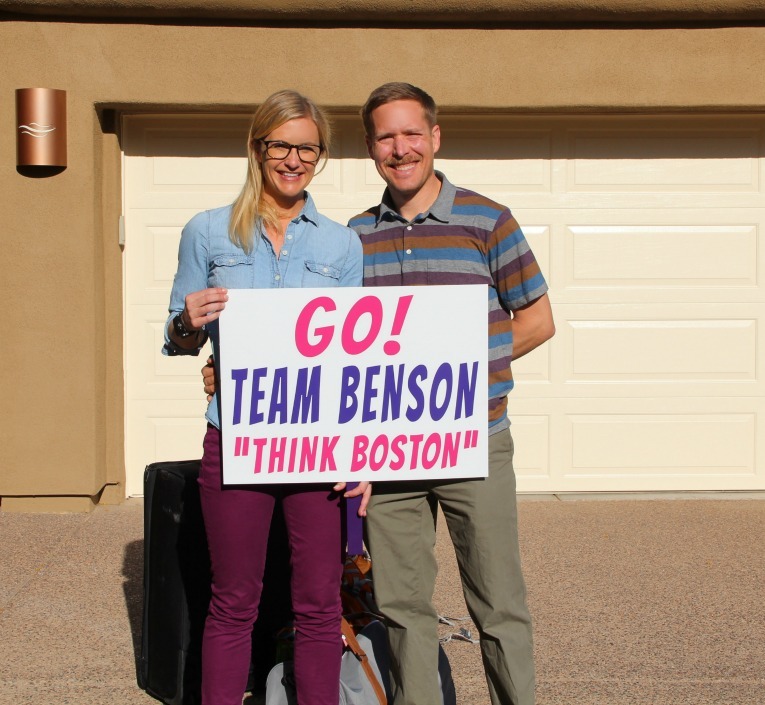 Yes, yes, I know that 34 seconds is not enough to allow me to actually register for Boston, but give me my moment…. I qualified for the Boston Marathon. I’m a Boston Qualifier! If you would have asked me 5 years ago, I would have told you that I never thought that this was possible, but I did it. I did it in the heat. I was on pace for 3:36 until mile 20. Maybe if it were cooler, I could keep that up. What can I do on a cooler day?!? I’m excited to find out! My total mileage per my Garmin: 26.21 miles! Damn, that’s a pretty good job of running the tangents, right? I give all the credit to my pacer, who constantly directed me to the correct side of the course. Dustin: he was a perfect pacer. 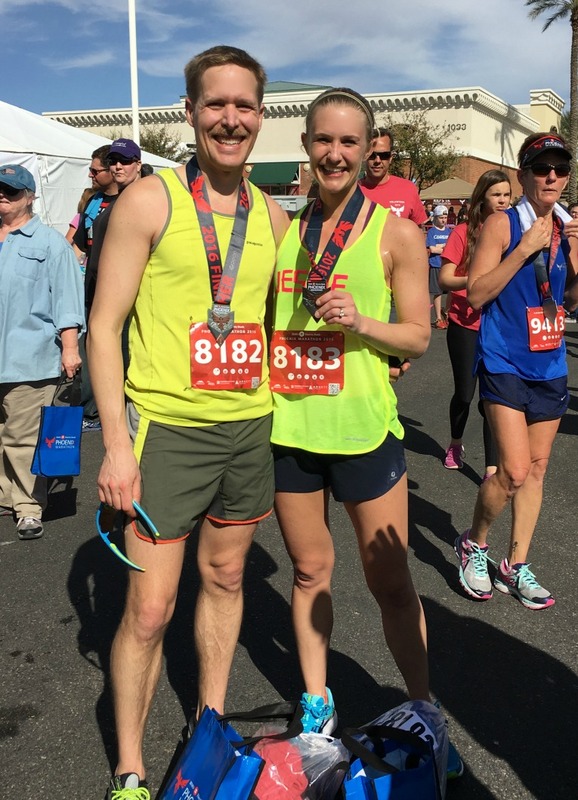 Running 26.2 miles with my husband was really special to me. I know it sounds a little corny, but it was really awesome to run a marathon with him. Running is a huge part of our lives and sharing the experience with him was very cool. This was my 21st marathon and his 24th, but the first time we have covered the 26.2 miles together. His mom took this short video of us coming into the finish line. This may never happen again, so I will treasure this footage! 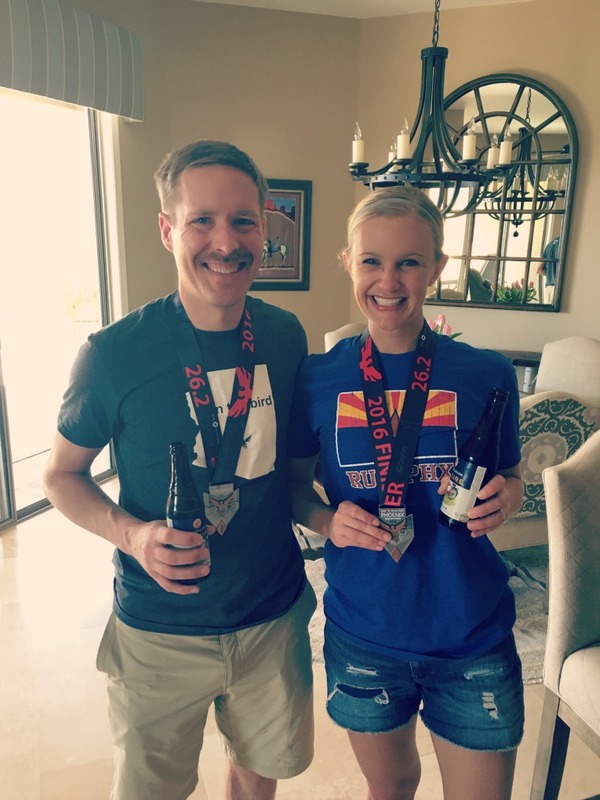 I asked Dustin to write a guest post about pacing me, so I’ll let him share more of the details on that, However, I can say that the first 18 miles or so were really fun; we chatted, we commented on other runners (who can run a marathon with their hair down? Boggles my mind), enjoyed the scenery, and the experience together. But he was patient and stuck with me and did so many things to make it easier on me. He’d run ahead at water stops to get extra water for me to pour on myself to cool off. He took my hat when I decided that “it was making me too hot.” He did everything he could to help me and I couldn’t be more grateful. Thank you Dustin! Thanks also to my coach Antonio Vega of Zoom Performance. This was my fourth marathon working with him. With each training cycle, I feel like he gets to know me and the training gets even better. I really have enjoyed working with him. Thank you also to my mother-in-law and Dustin’s stepdad for cheering for us and hosting us for the weekend. They treated us very well! Overall, I enjoyed the Phoenix Marathon. Even if it hadn’t been my first BQ, I think I still would have had a positive experience here. Yes, it was hot, but you can’t control the weather. The organization did their best to have enough support out there to help with the heat. It was well-organized and a generally pretty course. We stayed in Phoenix until Tuesday with my in-laws. They were great hosts and we really enjoyed our mini-getaway. I hope to write a “Fits on the Road” post with some info of what else we did while in Arizona. And stayed tuned for Dustin’s guest post on pacing me! « Weekly Recap: The Things You Can’t Control. Congratulations on your BQ! And in the heat of Arizona! Way to go! I really enjoyed reading this review and appreciated the details of your fueling plan. As a somewhat inexperienced marathoner, I’m always interested to learn what works for others. I’m looking forward to reading Dustin’s review. Hi Paige, I’m glad you found me 🙂 Yes, I run with Laura Woodbeck, she’s awesome! The dynamic of running with a spouse is definitely an interesting one…It sounds like you and your husband will have a “fun” experience too 🙂 Dustin isn’t really so chatty, but running together was still challenging at points, but overall, it was a really positive experience. I hope you have a positive experience too! Congrats Jessie! I’m glad you had a better pacer experience this time around! I hope there were tears of joy in the last few miles. I remember my BQ race and the emotion of realizing you’ve actually achieved it! Congratulations, Jessie. You BQed in the heat! What an amazing accomplishment. Thanks again for sharing all the details, from fueling, to splits, etc. I assume your strategy was even splits throughout, right? I’m so happy for you! Great race, and great job in the heat, uffda! I came across your blog when I was googling for a running coach. I just started working with Antonio in January as I’m trying to achieve a BQ as well (looking for that exact same elusive time you are). It is great to see how your running/training is going and see what is working for you. My next marathon is Fargo in May. Thanks for sharing on your blog! Keep up the great work! Glad you found me Jen and I hope you enjoy working with Antonio as much as I have. Good luck at Fargo- you shouldn’t have to deal with heat there right? First, Congratulations on a great race and your first BQ! I can imagine what a confidence booster it must be to have one under your belt, and to have accomplished it in the heat. I have a gear question for you – where did you keep your gus during the race? I have used a spy belt (or something similar) in the past, but would love to be able to ditch it, especially if it’s warm. Are those the toolbelt roga shorts? I have a different pair of Oiselle shorts that I love and was considering trying those. Pop the champagne and bring on the confetti! Congrats on the BQ!!! 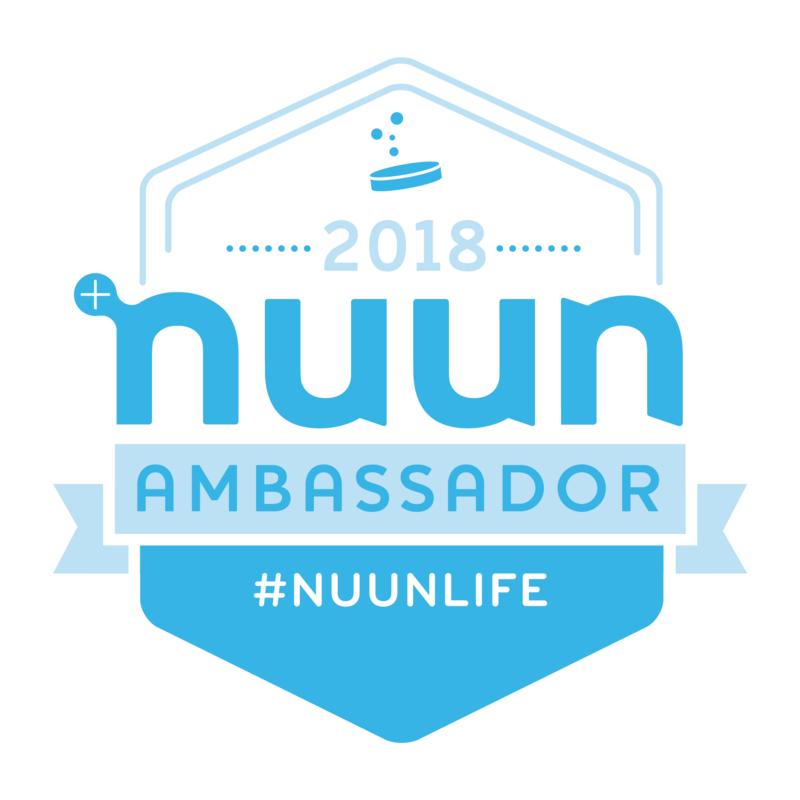 I bet you are so excited for your next marathon to see what you can do without the heat!!! I am really looking forward to reading Dustin’s recap as well as your Fits on the Road post– I always love those! I’m glad you enjoy Fits on the Road- I like writing those…it’s fun to document trips and I hope they are helpful to people who may travel to the same location! Congrats! That is awesome. I lived in Utah for 2 years and the dry heat is so much better than humidity but it’s also something to get used to. When I moved there in the summer, I couldn’t even run a few miles without water or feeling like I was going to die. Heat is still heat; training through a Minneapolis winter doesn’t really prep you for any kind of heat! 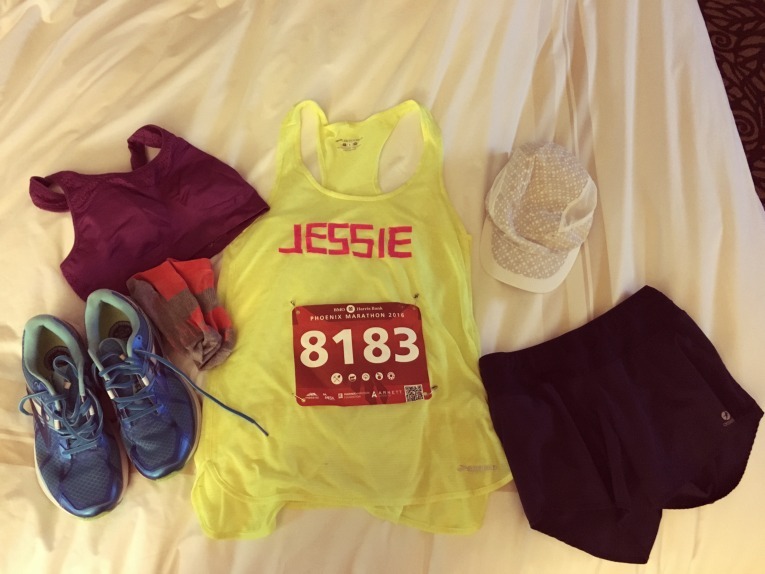 Congratulations on your BQ, Jessie!! 🙂 That’s so awesome; especially in the heat! Great job! Love the PR bell — that’s a fun touch. Good to know! I would imagine it will be our Louisiana when we run that state- I will have to get your tips then. Hi Jessie! 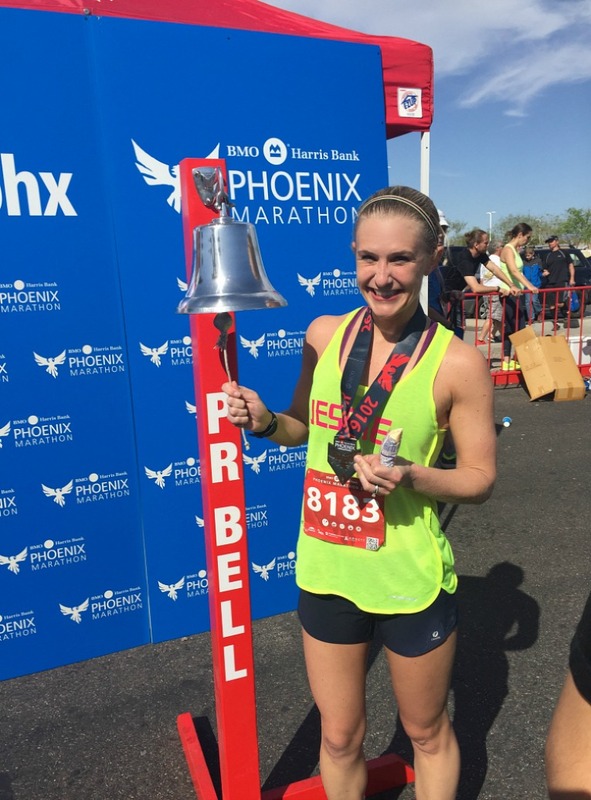 I saw your recap on the Phoenix Marathon’s Facebook page and found myself “binge reading” and enjoying all your marathon posts! So fun!! I live in Boise, Idaho and the Phoenix heat really got to me after mile 21! Yikes…. Thanks for writing such interesting race recaps. Hope you do a marathon in Idaho someday soon! Cindy, I’m so glad you found me through sharing my post with the Phoenix Marathon page! I haven’t run a marathon in Idaho. Is there one you would recommend? Thanks for reading and commenting and congrats on Phoenix! Oh Jessie! Thanks for your comment! You made my day! As far as Idaho marathons…I’m not sure which to recommend since I always travel to run full marathons. I’ve done every possible Idaho half marathon though. We are getting a new marathon in Boise this Fall called “Onward Shay.” It’s being put on by the New York Road Runners and seems pretty cool. I’m planning to do it if I don’t get into NYC or Chicago or St George… Big dreams!! Thanks again for your awesome blog! I’m learning so much from you! Oh, St. George is the BEST. So beautiful. Good luck, I hope you get in! 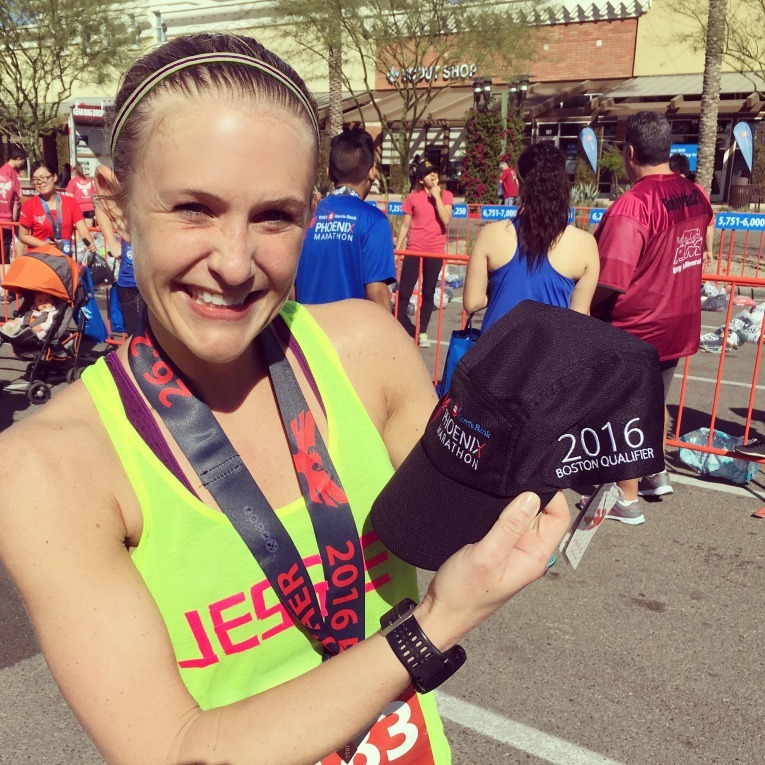 Such a great day, Jessie – and, no doubt crossing that finish line was incredible! Biggest congrats on your BQ! You race an crazy consistently paced race! Well done!